I didn’t mean to be away from my blog. I didn’t mean to leave you starring at this olive and chicken tagine, which started to go bad, for this long. August has been very busy around here. And the busiest month is yet to come, both for my kitchen and I.
I don’t know about you but since I can remember, our summer afternoons have always been filled with preserving the year’s bounty. It was a ritual, written in our book of life. The next day was the same: peel, seed, halve, blanch, roast, cook and freeze, chitchat chitchat, repeat! By the third day, afraid of not being able to reach the lower part of the crates and just growing tired of all these never ending crates laying around the kitchen, my mother would give the rest to neighbors and friends saying to herself that we have fairly enough for the winter. Until next summer comes along with crates, funnels, ladles, pots and wiser hands. This year, although away from my mother’s kitchen, was no exception. Green peppers have been roasted and frozen, strawberries and blueberries were turned into jam, verbena was dried for our late nights herbal teas, basil was turned into pesto, pounds and pounds of ripe, delicious tomatoes were turned into the most exquisite tomato sauce and hot peppers were either roasted and frozen, or dried and turned into Mo’s, that would be my other half, signature hot sauce: Harissa. Although being a North African condiment, I didn’t grow up eating Harissa that much. The rare occasions where I would have Harissa was at street vendors where they serve it along with Karentika, a chickpea based snack a bit similar to the Italian Farinata. Though it added a nice heat to the snack, I didn’t enjoy Harissa by itself. It was unnecessary hot and that was it. No flavor, no aromatic spices. Just hot! And then came Mo, with dried chilies in one hand and tales of the best Harissa he’s ever had, while studying in Paris, in the other. All I knew about Harissa was shattered into million pieces and blended with the dried chilies and the spices, and I loved it. I loved being wrong because my life will never be the same without Mo and his four jars of Harissa in our fridge. And while I wish I could give you the recipe of his Harissa, there is a tiny close in our marriage contract, next to the do-the-dishes-from-time-to-time-honey close, that says that I shall never give away his recipe to anyone. But you can always persuade him to send you a jar or two. 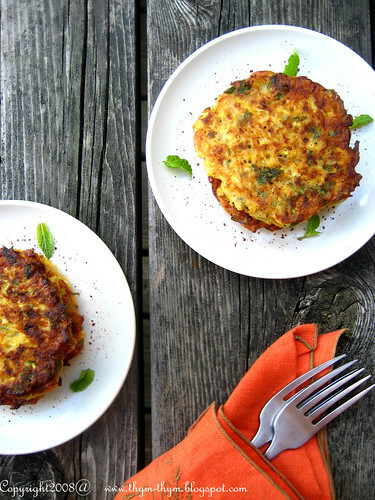 We usually eat Harissa as a condiment with soups, tagines, grilled kefta, couscous…in a word everything but desserts and salads, but this time I wanted to mix it to my usually boring squash fritters batter. 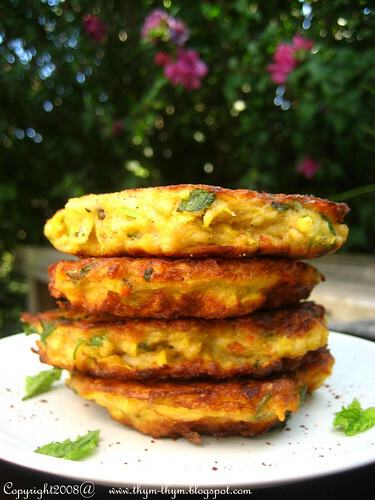 Yellow squash can be very bland sometimes and the warmth of Harissa along with cumin, coriander seeds, garlic and mint add a much-needed burst of flavors to the fritters and conclude a happy ending to an intense day of preserving summer. In a large bowl, combine the yellow squash with the rest of the ingredients. Heat a film of olive oil in a nonstick sauté pan over medium heat. For each fritter, pour a generous tablespoon of the squash batter into the pan. Turn them over after the bottom turns golden. Cook on the other side until golden. Drain on paper towels. Serve right away. Dans un bol, mélanger les courgettes essorées avec le reste des ingredients. Faites chauffer un filet d’huile d’huile dans une poêle ainti-adhesive sur feu moyen. Pour chaque beignet, verser une cuillere à soupe du mélange de courgettes dans la poêle. Retourner quand la surface des beignets prendra une belle couleur dorée. Faites cuires l’autre coté jusqu’à obtenir une belle coloration. Egoutter sur du papier absorbant et servir tout de suite. Ça j'adore. J'en ai justement fais hier. I have to say Mo's Harissa is very very very good I LOVE it it is full of flavor and just the right amount of heat and it is good on almost anything so I know that it had to be great with squash fritters. I love your story about putting up food for the winter I too remember doing that with my mother as a child. I often wish that it was still a necessity. I will be making apple and pear butter here in the next few days. Very nice indeed! Oh Rose, I love love Harissa. Will be using it more often once I am back in Melbourne. I love this. No other words to describe. Thanks! 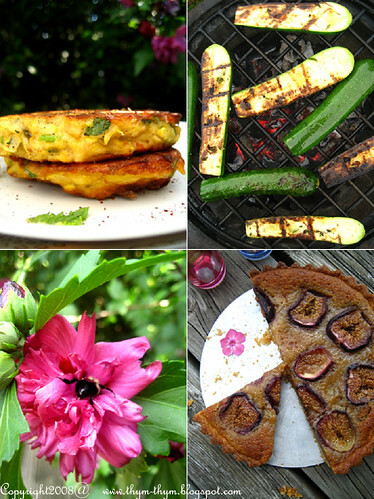 I love anything like zucchini fritters and have a fridge full of yellow zucchini right now. (And mint growing on our balcony). I, too, have spent many hours this summer freezing, planning, cooking, etc. It's going to be a tasty winter! You have such beautiful pictures! This sounds great and my parent's just gave me a jar of homemade harissa. Welcome back! How does one go about getting a jar of this lovely sounding harissa? - Anh, have a safe trip back, my dear! - Mona, that is sweet of you! I missed all my friends as well! - Jen, we've been blessed with our farmer's market this year. Every Saturday is more exciting than the others. We grow mint every year, but mainly for tea. - Louise, bienvenue! Et merci beaucoup de ce gentil mot. - Colleen, I've missed you too, my dear Colleen. I am so happy that you gave my chicken a try, and even happier to hear that you liked it. Mo tells you that he would provide you harissa as much as he could if only you were closer. Hope the moving is doing well. Hugs, my dear. And special hugs to J and T for me. - Maggie, lucky daughter you are! I bet it must be delicious. - Allie, send me you e-mail and I will be happy to send it your way. Nous allons donc passer l'hiver à baver devant tes recettes faites à partir d'alléchantes conserves maison et autres douceurs sorties de ton congélateur ... j'en souffre d'avance ! Sounds like you've been doing wonderful things in your kitchen. I'm dealing mainly with my heirloom tomatoes. Have a wonderful tomato risotto on my blog. The tomato base freezes beautifully and when I make a pot of risotto with it in the dead of winter it tastes just like summer! - Marion, A savoir si il en restera d'ici l'hiver ;)Bisous et bon debut de semaine. - Eileen, aren't tomatoes just the jewels of summer! Your delicious recipe might be the one to help my fear of risotto. Thank you for sharing it! No complaints about the extended availability of the bjej+zeytoun recipe- that turned out to be quite convenient- but I have missed your spirit! Can we expect a recipe for the fig tart in the photo? - Y, thank you very much! I've missed my blog as well. The recipe of the fig tart, actually, can be found here. What I have changed this time is that I first decided to reduce the amount of sugar, then decided to use honey instead of sugar for the frangipane, which added a beautiful golden color and gave a nice touch to the tart. Also I used a combination of ground hazelnuts and almonds for the frangipane, and flavored it with 1 tbsp of rose water, as I find it to work beautifully with figs. I dont know what harrissa is. Do they sell harissa at the supermarket or only at specialty shops? - Farina, harissa is a spicy hot sauce from North Africa. The good one is supposed to be very aromatic and not only spicy hot. You can find it at specialty stores mostly. If you have a World Market in you area, look for Mustapha's Harissa. I've never tried it, but seems like a good one compared to others.